I was very kin to play that game simply because I was curious about new daemons. What is more, the armies I faced before didn't have that many nurgle units with the typical exception of the plaguebearers and bsb herald. I expected them to make an appearance but then the rest of the army was still some kind of mystery. Quite compact and definitely tough army. GUO and Souldgrinder with T7 were definitely problematic. But I knew that with the appropriate amount of fire I can still wound them and then they become more vulnerable, also in combat. The same goes for the unit of Plaguebearers. They are tough and with regeneration so that I would suffer simply because they would deflect many of my attacks. Combination of -1 to hit penalty, T4 and some kind of ward save is simply fantastic. I wanted to avoid that unit if I could and deal with the rest of the units. Only having accomplished that I could try and get a combined charge. Even then a success is not guaranteed as it could have been against less resilient foe. I also had to deal with the herald, as with him the unit is more powerful than alone. (not that it needs more resilience in my opinion :P). I made a few changes to my previous list. The main one being to replace the Archmage with the Loremaster. Another thing I wanted to see is how a lone Loremaster, being a level 2, would stand up to a challenge against Level 4 and 2 level 1's as a support. Not to mention the effects of the Realm of Chaos during magic phase! Before the battle ardnunuff rolled for the gifts. GUO got ASF Sword and 2+ armor save. There goes my master plan for shooting him to death :) But in exchange a Searing Doom just got a good target! Herald got Plague Flail. 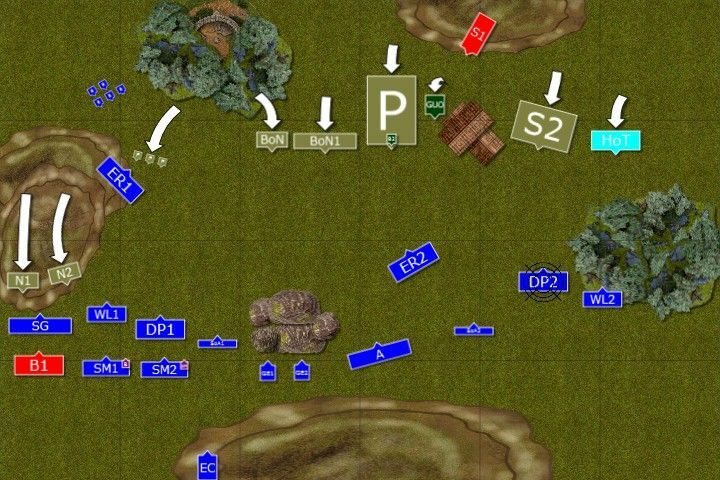 Deployment of the armies after vanguard and scouts move. I deployed in weighted flank formation because of two reasons. First, I wanted to give myself more time to maneuver and shoot at the beasts of nurgle before the combats. Second, having small delaying force to dance around soul grinder and horrors should keep them away from majority of the army thus allowing me to "ignore" tzeentch spell too. Bob and Larry had Swordmasters bodyguards each with the Loremaster closer to the center of the formation. Also, the Lions with Gleaming Pennant were on the right flank. After explanation what spell does what I decided that Rancid Visitations is the no. 1 spell to dispel with Spirit Leech or Curse of the Leper as a second one. 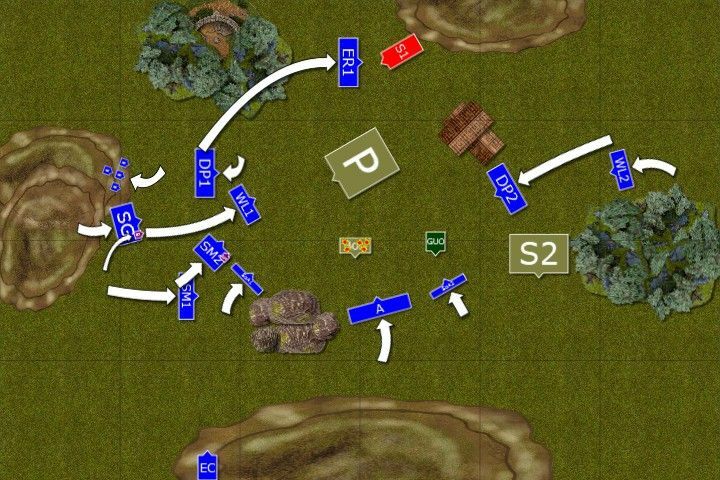 I was then nicely surprised to win the roll-off and I had a first turn! 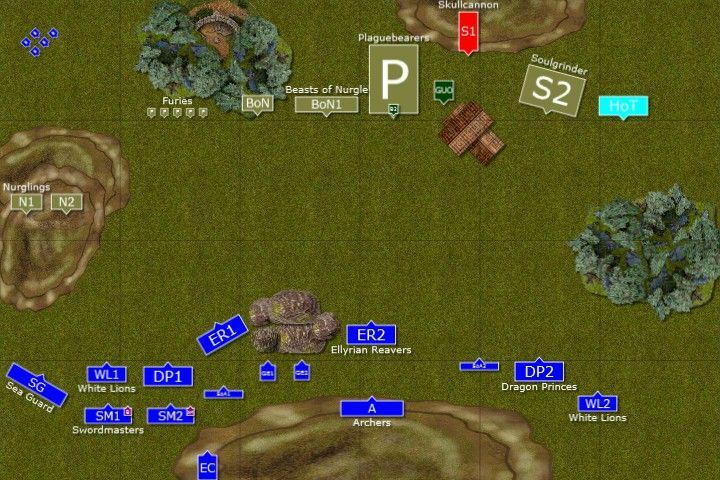 Using the rare opportunity to move first the elven army closes distance to the enemy at both flanks. Attack is the best defense after all! Larry immediately engages in a mental duel with a greater daemon, probing the magical defenses. To his disappointment he could not find an opening he hoped for just yet. Then the shooter opened fire. 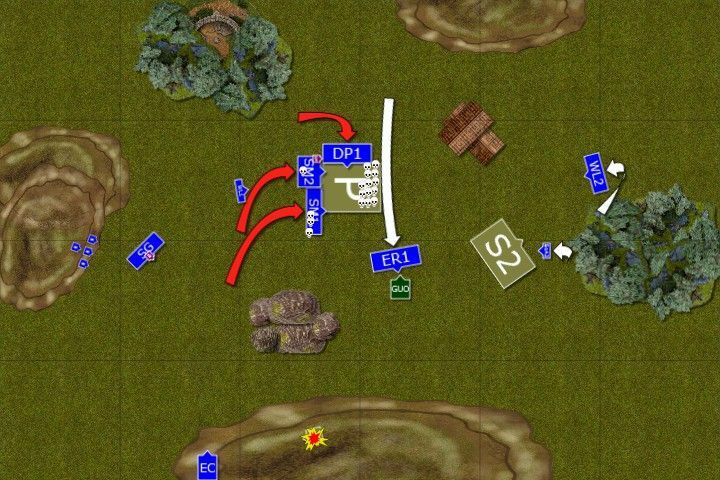 It was a little divided as not all the units were yet in range for the same target. Nurgle daemons proved to be more resilient than expected and only few arrows actually wounded anything. Main formation of the daemonic army slides forward in a somewhat lazy fashion. The daemonic engines belched warp tainted energy but the missiles prove to be ineffective just yet. The winds of magic, however, blew strongly and gave birth to a small detachments of blood letters, who appeared just behind the sea guard on the Western flank. The lore master had to focus on dispelling only a fraction of the power his enemy wielded. As a result dragon princes on the Eastern flank were suddenly overwhelmed by sickness and felt extremely weak. Not wanting to have the enemy behind, High Elves attack smaller daemons. 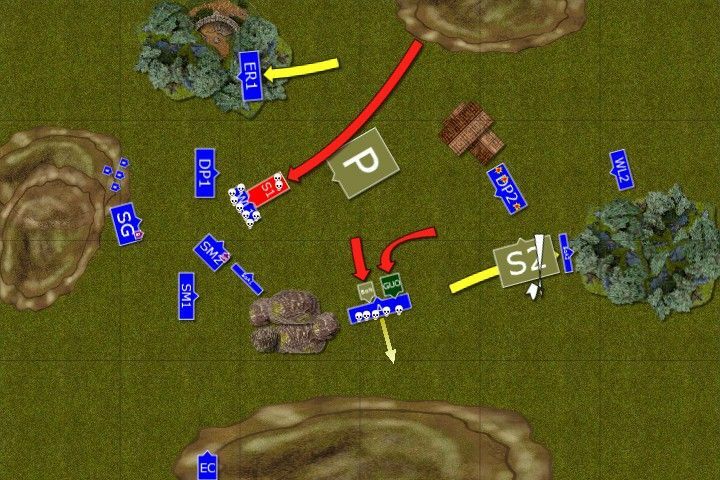 Shadow Warriors flank charge furies and destroy them quickly. Nurglings are mercilessly cut down by the sea guard and swordmasters. 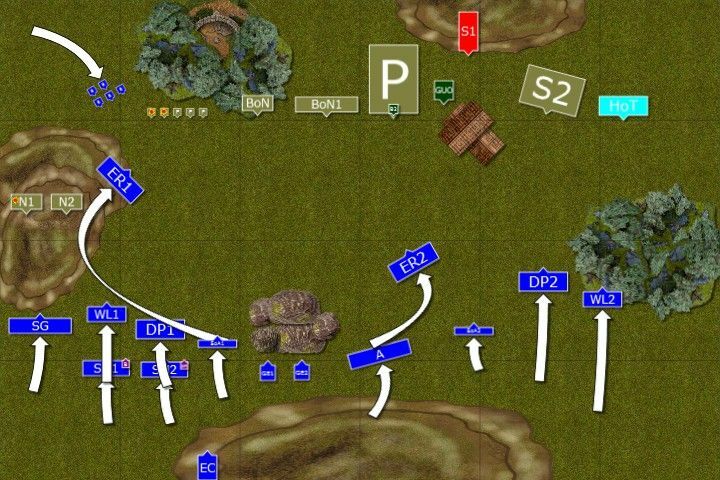 Both units then reform to face a new enemy. Unfortunately, Dragon princes were not able to make contact with the horrors and shooting as well as magic still struggled to do anything. 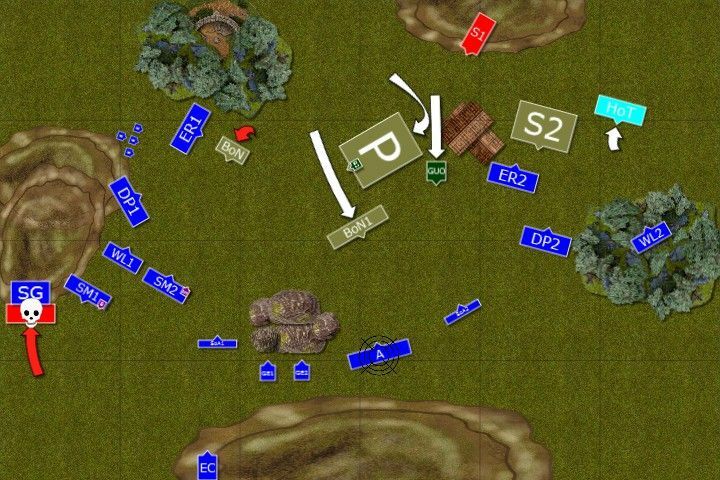 Daemons on the Western flank try to counter attack. However, iron discipline of the sea guard allows them to shoot down a few before they finished the rest in merciless combat. Beasts of Nurgle, on the other hand, didn't quite move in a energetic way to reach nearby dragon princes. On the East the soul grinder and horrors tried to use their respective daemonic powers to hurt incoming elves but it didn't work this time. Archers became another victim of the curse. Both squadrons of the dragon princes leveled their lances and charged. On the West , the target was beasts of nurgle. This time the Loremaster was able to support his troops and the cavalry were filled with savage spirits that made them even stronger. The beasts stood no chance. On the East half of the horrors were impaled but the rest refused to break their bond with material plane just yet. The Loremaster, seeing that the concentration of his daemonic adversary was broken, pressed harder and utterly destroyed daemonic herald too, releasing its corrupted soul to the immaterium. Shooting also proved to be efficient at last and a second unit of beasts of nurgle was significantly damaged, losing one beast and having one of them barely hanging on. 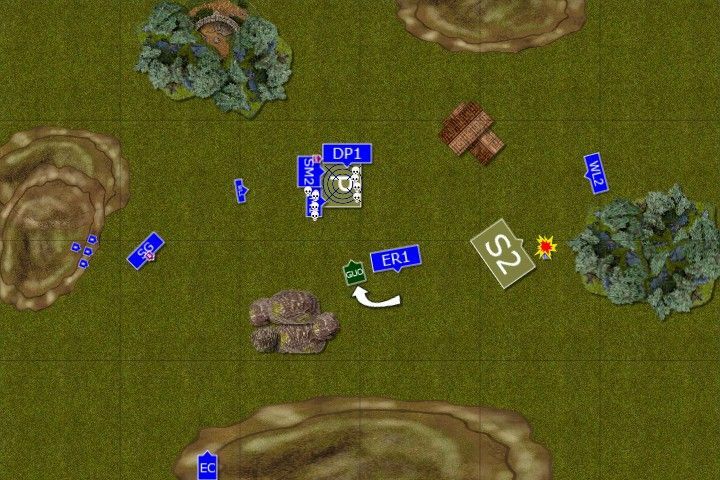 Enraged by the bold elven attack, daemons counter. Both eagles are destroyed although one of the noble birds manages to finish off the wounded beast of nurgle before it is overwhelmed by others. Soulgrinder, tired of not being able to claim lives with ranged attacks charges ellyrian reavers. Swift elven cavalry withdraws but is still caught in pursuit. 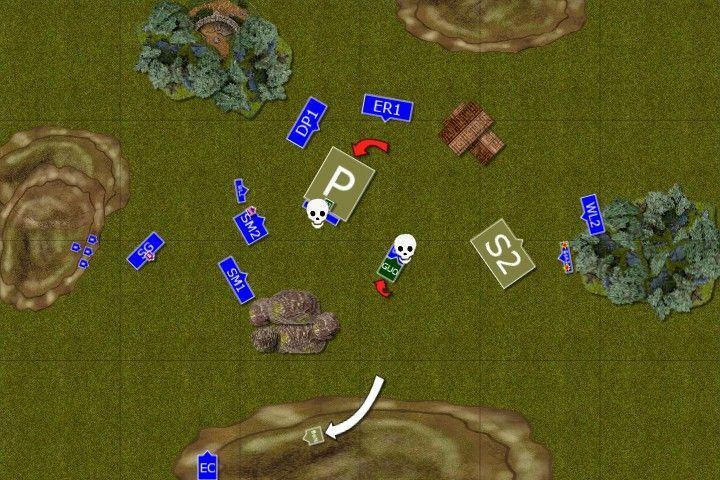 Also the skull cannon rumbles forward but in this case the light cavalry manages to retreat to safety. Elven units use the opportunity to swarm around plague bearers while either blocking other daemons or moving out of their sight. Shooters keep peppering beasts of nurgle with arrows and only one remains, barely keeping the contact with physical world. 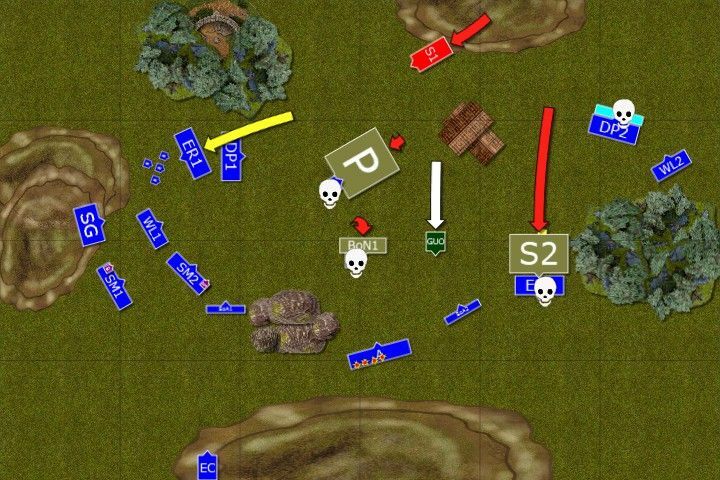 The trap to lure skull cannon into the woods didn't quite work as instead of chasing the reavers to the forest, the cannon changed the direction and slammed into white lions. Brave Chracians held the monster but had to pay dearly for that. Beast and Great Unclean One attack the archers who try to hold but are unable to inflict the last wound upon the beast. Archers break and are run down by the wounded daemon of nurgle. Great Unclean One turns back his attention to the center of the battle field. Soul grinder also spins around, just in time to catch Dragon Princes in fire. Only 2 knights survive but they refuse to panic. Loremaster and his companions (now protected by Life Magic too!) come to the rescue and destroy the skull cannon. The rest of the regiments surround plague bearers once more, while Dragon Princes block Great Unclean One from joining the fight. Plague Bearers and Great Unclean One get rid of the interfering units but that is all they can do for now. Combined charge - at last! Finally High Elves could charge in unison. 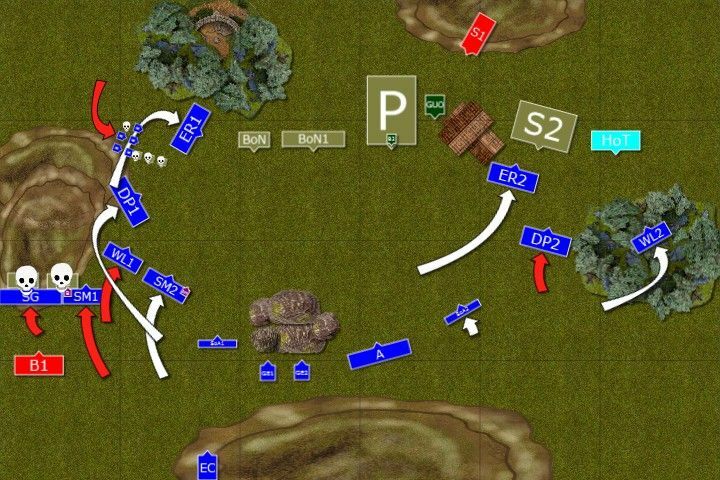 3 units attacked as one. Loremaster strengthen his companions with the savage magic and they all stormed in. Half of the Plague Bearers unit ceased to exist but it was not yet enough to remove the threat entirely. The fight continued. In the meantime last beast of nurgle was finally destroyed before it reached the crew of the eagle claw. When it seemed like the fate of the plague bearers is sealed, their general and leader stepped in. It summoned powerful energies and the Loremaster was unable to stop it. In no time the tough flesh of the plague bearers became even tougher and elven warriors broke many blades trying to harm them. As a result only a handful of daemons remained but ... they were still there. With a silent order, remaining daemons disengaged and slowly moved back from where they came from. The elven army re-grouped. Unlike daemons they needed time to recover and resume pursuit. It was a great battle and I wanted to thank ardnunuff first for the offer to play and then for a great time during the game! Boy, but these beasts of nurgle are tough. I am glad that I managed to get rid of them and that after 2 turns of no effect I was able to hurt them later on. But that also meant I could not aim at soul grinder (not to mention it was fortunately busy on the other flank). I was very happy with the outcome of the game as I managed to win by 400+ points. I do, however, know that my final success was in big part thanks to the very careful approach by ardnunuff. 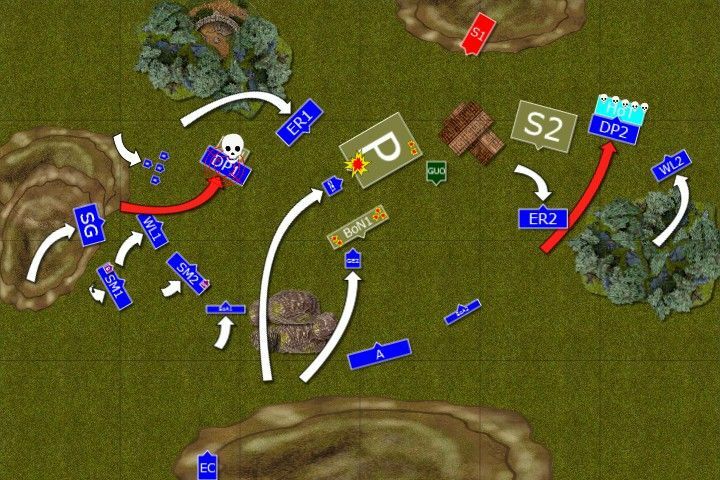 He left the entire flank for me to maneuver and didn't press forward fast enough either. I am sure he will not do that again! At the beginning, the positioning of nurglings allowed me to charge them both and crumble them as a result. That, in turn, allowed me to reform and face blood letters who suffered in one-on-one combat. Also, failed charge by beasts of nurgle helped here. I am not sure if Dragon Princes managed to hold if charged. In any case that would slow my advance for sure. The moment when I think I made a serious mistake was fleeing with reavers from the skull cannon. Initially I wanted to hold and sacrifice them so that the rest of the units could charge earlier. 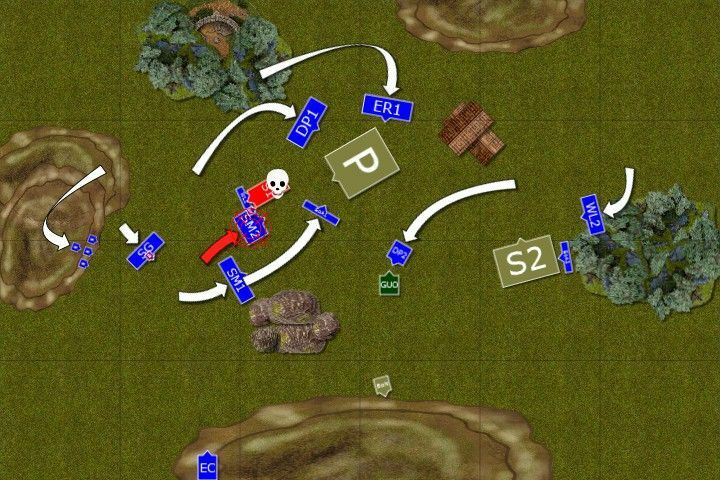 I had a chance to flee and draw skull cannon into the forest but with Ld7 odds are still not in my favor. The distance was significant but then one should not risk such situations at all. I am glad I got the cannon in the end but as a result I lost time to charge plague bearers and I could not finish them off. They were much more valuable target than the cannon. Also, a game winning spell was Fleshy Abundance. T6 plague bearers survived the second round of combat which ended up in a draw! Only 9 daemons remained but it was enough to survive and that matters. Ardnunuff cast this spell with 6 dice and I failed to get double 6 on my own 6-dice dispel attempt. I must admit I liked the Loremaster in that game. He kept the pressure on the GUO in battle of the minds. Ardnunuff often dispelled magic missiles as both, fire ball and burning gaze are dangerous to his units. Thanks to that I managed to sneak in other spells such wyssan wildform, earthblood or, the most spectacular, spirit leach that killed herald bsb! The idea to make a decision which spell to dispel and which to let go was a good one and despite being level 2 I managed to dispel the spells I didn't like in general. Of course sometimes dice rolls are not good enough but I don't think that in these cases having a book of hoeth changed much. Another interesting experience was with Realms of Chaos. In the first turn I got additional unit to deal with but fortunately for me it was not that bad. I think I have also received something like 2 Slaanesh effects and 1 of each of the other gods. The good part was that only once or twice a 6 was rolled and even then the effects were not bad. I am fully aware that it was my great luck and I must admit that ardnunuff rolled a massive amount of 1's for these tests.